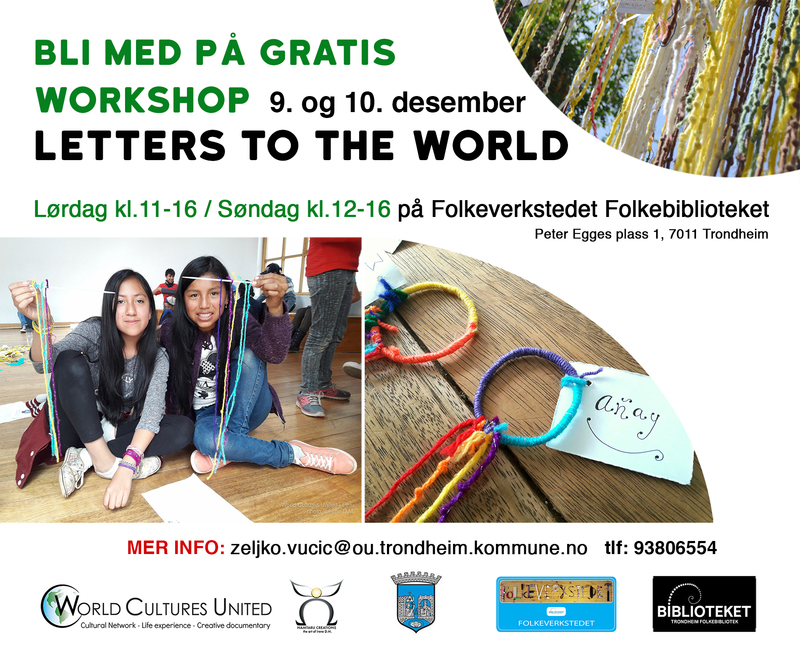 After our successful workshop and art installation in Kristiansand last summer, WCU arranged the last “Letters to the World” workshop and exhibition of 2017 at the public library in Trondheim (Folkebiblioteket). The two days workshop event took place at the public workshop (Folkeverkstedet) and a little exhibition will remain until Christmass holidays break. We shared WCU experiences with participants of all ages who came from different countries (Croatia, Rumania, Turkey, Belgium, Italy, Germany, Bolivia, Norway, Siria, Palestina) in the beautiful space for creative learning leaded by Zeljko Vuvic from Croatia. We are very happy and thankful for having received his support and assistance during the workshops and preparations. Thanks to all participants for taking part in this nomadic project, which will be traveling abroad in 2018 again. Sicily and Russia are in our “upcoming events” list. This event was supported by Trondheim municipality and the Public library in Trondheim. We thank and credit Letizia Jaccheri, Alberto Comrado and Zeljko Vuvic for helping us with photo documentation. See our video about “Letters to the World” and follow us on Facebook WCU.